The only child of a prominent barrister and his wife, Evelyn Underhill was born in Wolverhampton, England, and grew up in London. She was educated there and in a girls’ school in Folkestone, where she was conﬁrmed in the Church of England. She had little other formal religious training, but her spiritual curiosity was naturally lively, and she read widely, developing quite early a deep appreciation for mysticism. At sixteen, she began a life-long devotion to writing. Evelyn had few childhood companions, but one of them, Hubert Stuart Moore, she eventually married. Other friends, made later, included such famous persons as Laurence Housman, Maurice Hewlett, and Sarah Bernhardt. Closest of all were Ethel Ross Barker, a devout Roman Catholic, and Baron Friedrich von Hügel, with whom she formed a strong spiritual bond. He became her director in matters mystical. In the 1890’s, Evelyn began annual visits to the Continent, and especially to Italy. There she became inﬂuenced by the paintings of the Italian masters and by the Roman Catholic Church. She spent nearly ﬁfteen years wrestling painfully with the idea of converting to Roman Catholicism, but decided in the end that it was not for her. In 1921, Evelyn Underhill became reconciled to her Anglican roots, while remaining what she called a “Catholic Christian.” She continued with her life of reading, writing, meditation, and prayer. She had already published her ﬁrst great spiritual work, Mysticism. This was followed by many other books, culminating in her most widely read and studied book, Worship (1937). 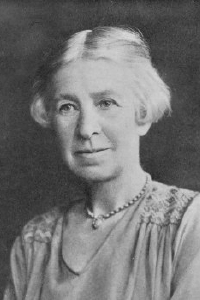 Evelyn Underhill’s most valuable contribution to spiritual literature must surely be her conviction that the mystical life is not only open to a saintly few, but to anyone who cares to nurture it and weave it into everyday experience, and also (at the time, a startling idea) that modern psychological theories and discoveries, far from hindering or negating spirituality, can actually enhance and transform it. Evelyn Underhill’s writings proved appealing to many, resulting in a large international circle of friends and disciples, making her much in demand as a lecturer and retreat director. She died, at age 65, in 1941. I O God, Origin, Sustainer, and End of all creatures: Grant that thy Church, taught by thy servant Evelyn Underhill, guarded evermore by thy power, and guided by thy Spirit into the light of truth, may continually offer to thee all glory and thanksgiving, and attain with thy saints to the blessed hope of everlasting life, which thou hast promised us by our Savior Jesus Christ; who with thee and the same Holy Spirit liveth and reigneth, one God, now and for ever. Amen. II O God, Origin, Sustainer, and End of all your creatures: Grant that your Church, taught by your servant Evelyn Underhill, guarded evermore by your power, and guided by your Spirit into the light of truth, may continually offer to you all glory and thanksgiving and attain with your saints to the blessed hope of everlasting life, which you have promised by our Savior Jesus Christ; who with you and the Holy Spirit, lives and reigns, one God, now and for ever. Amen. This collect doesn’t seem to capture the essence of what Underhill taught us by her life or her works. I hope someone with deeper knowledge of her vision can help. I would rather pray that:..
…the church, taught by your servant E.U., may continually seek to live close to the heart of God and, guided by the Holy Spirit, continually worship and serve in spirit and in truth. I agree with Susanbutler–Evelyn Underhill was and still is a fountain of refreshment to this very day. I have read her major works and they have a luminescence rarely found in spritual writings. Hi Kathy, Thanks for your comment. Next time please include both your last name. — Ed. I absolutely Adore Evelyn Underhill…she has been such an inspiration in my own spiritual journey as a priest…and as a human being. the reprinting of her retreats are such a wonderful guide to spiritual renewal..
and learning…she has given so much…to so many…..and continues to give… I am grateful! This commemoration is already included in the Calendar. The New Testament reading is new. Bio She needs a ‘Who she is’ and ‘Why she is important’ statement. Fourth paragraph: I would have thought Mysticism, not Worship, is “her most widely read and studied book.” What’s the evidence for this claim? In preparation for our commemoration of Evelyn Underhill yesterday (I’m writing on Thursday 6/16) I opted to use Psalm 96:7-13 (one of the options in LFF 2006) instead of the selections from Psalm 37. First, I think it’s a better selection (personal opinion!). But second, particularly for services that will presumably only be celebrated on weekdays, with a small congregation and no printed bulletins, I think it’s thoughtless to assign “broken” psalm selections. It’s confusing and distracting to make the praying of the Psalm a Big Complicated Deal. We should be able to focus on the psalm text, not the “right” verse numbers. This issue doesn’t come up frequently, but it does occur often enough through the year that these assignments ought to be reconsidered. She deserves to be commemorated. The service seemd appropriate. She was in LLF. I suggest a subtitle, such as “Author and Mystic, 1941”. Line 2, first paragraph: add “on December 6, 1875” after “born,”. Line 1, third paragraph: substitute “continent of Europe” for “Continent”. Line 3, sixth paragraph: add “London, on June 15,” after “in”.